So, recently I’ve gotten addicted to knitting cute toys that have daily uses as well as being cute. 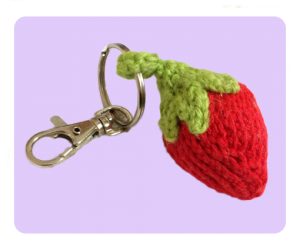 This is why I’ve turned this free strawberry knitting patterns into a keychain. 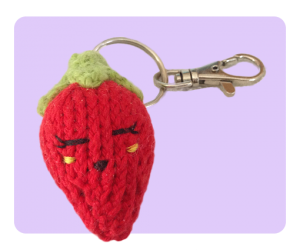 I’ve done few different versions of the strawberry finishes — with and without the face, with and without the yellow seeds. Which do you prefer? Leave your comments below! 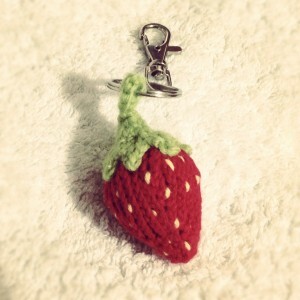 I like how the size of the knitted strawberry is similar to a life sized one. As for the knitting patterns, I have put it down as intermediate instead of easy. This is because the stem is a little tricky! 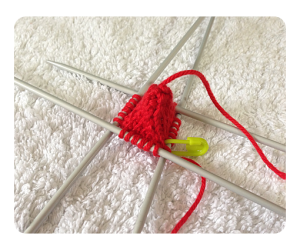 But don’t worry, I will include a video tutorial on how to knit the stem so you will have no trouble knitting them. 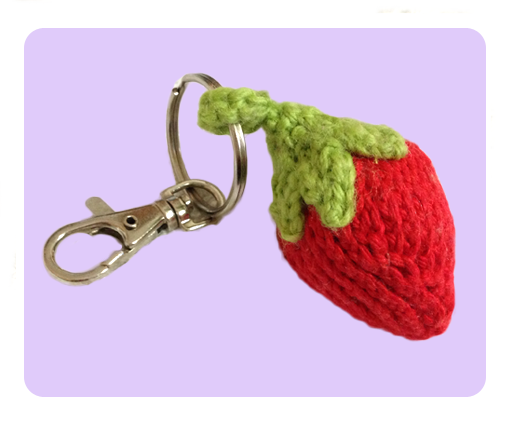 For the keyring, I’ve purchased mine from eBay. Must say I am very happy with the quality of the items for the price. For 12x Lobster Clasps and matching Split Rings , it only cost $2.99 AUD $3.79 AUD (includes free shipping too!). The items are shipped from China, so it may take a while but it’s worth the wait. Not important as it doesn’t need to fit. *Tips* Select slightly smaller needles for the recommend size yarn so stuffing doesn’t show through. Starting from the bottom, with DPN and Red, CO 4 sts. I evenly divided the sts to 4 DPN (1sts each). But you are more than welcomed to divide it to 3 DPN 1-2-1 sts each DPN. Being careful not to twist. Cut yarn. thread through each remaining loop with tapestry needle. If you are embroidering the face, don’t close up the body yet. Do all embroidery now (face & seeds). Stuffed the body with fillings of your choice. Once finished, pull yarn tight to close up the hole and secure. Starting from the top, with DPN and Green, CO 4 sts. Leave approx. 80cm tail as you will need it for making up the keychain loop later. Being careful not to twist. Now you will notice you have reached the peak of your leaf. All is well, except the working yarn is too far separated from your next live stitch. What you want to do next is to pick up 4 stitches on the left edge of your leaf so you can slowly bring that working yarn down next to your live stitch. Once you finished picking up 4 stitches on the edge and bringing that working yarn down, you want to join that stitch to the first remaining stitch. To do this, you slip the next stitch purlwise, then you pass the stitch that you have bring down earlier to this slipped stitch. Yay, you have just knitted the first leaf! To do all the next leaves, the steps are exactly the same except for Step 1. Step 2-5: same as above. Repeat above process until you have total of 6 leaves. Then, cut yarn and seam. To make the keychain loop, you want to CO 10 with the long cast on tail earlier. 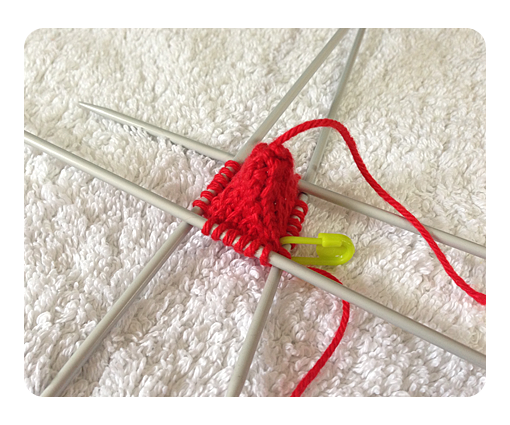 Use tapestry needle to create a loop and secure the remaining yarn together. Attach stem to the top of body with green thread. Use a thread instead of yarn as you want the join to be invisible when finished. Insert the split ring to the loop and you are done! (DPN) double pointed needles, baby toys, cute amigurumi toys, face embroidery, free knitting patterns, intermediate knitting patterns, kid toys, knitted food, knitted toys, strawberry stuffed toys. Bookmark. Hi! I love the pattern but I’m new to using double pointed needles and increasing. I made the strawberry and the only problem is the increases are noticeable. Are they supposed to be like that? Do you have any tips or tricks for increasing so it doesn’t show as much? Thank you. Now ill try to make the stem! Hi Ariana, Sorry for the late reply.. I’ve been busy with other things. Try use smaller needle for the recommended yarn size and the increase won’t be as noticeable 🙂 Generally when making toys I use smaller needles so the end product looks more compact and structured. When I make the strawberry the increase is barely noticeable. Hope this helps..! 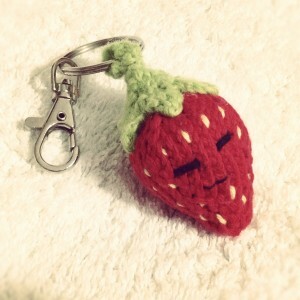 I love the keychain. Do you have others?I have a few toy patterns I could let you have as well. Hi Pat, Thank you for your comments! 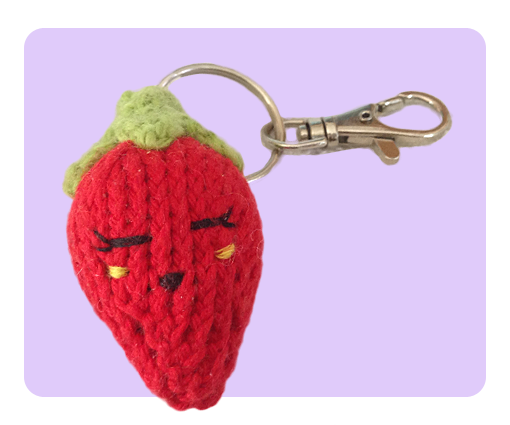 I don’t have other keychain pattern right now (this strawberry is the first one I designed) I am happy that you like it, I will be sure to design more keychains in the future 🙂 If you are looking for toys, I have some more (they are in the “Free Knitting Patterns” menu link). If you have some patterns you want to share I would love them, thank you!